The reappearance of Ash MacBryde’s old lover has sent Oak flying back to Vermont and into the employ of a man determined to win a chance to race at World’s in Dubai. To Oak’s delight and dismay, the man who brought him out of the bolted closet is there too, working for the same man with the same end. They will be partners on horseback ... and if Ben Kincaid has his way, in other ways as well. Someone holds a grudge against Oak’s new employer; and as the race approaches, the dirty tricks escalate until no one is safe. Oak and Ben are in danger, and when Ash shows up to bring his man back home, there’s more at stake than just a shot at a million-dollar purse. Maybe there’s just one sure way for the reclusive Oak to face his domineering, possessive man. It’s called STRAPPING ASH. After Ash MacBryde’s seeming betrayal, Oak Richards bolts for home, looking for a safe haven to work away the hurt. The last thing he plans on is MacBryde showing up like a bad penny. Their first meeting after weeks apart is… awkward. Oak squeezed past, trying not to touch any part of the man. He took his time arranging the grooming tools, putting off having to face Ash MacBryde, his throat nearly closing with anxiety and terror. All his plans, everything he wanted to say flew out the barn door, leaving him as tongue-tied and unsure as ever. Finally finding the courage to stand and face the man he once thought of as his life partner, he nearly panicked as Ash closed the distance between them. Stepping back, he held out a hand to warn Ash off. 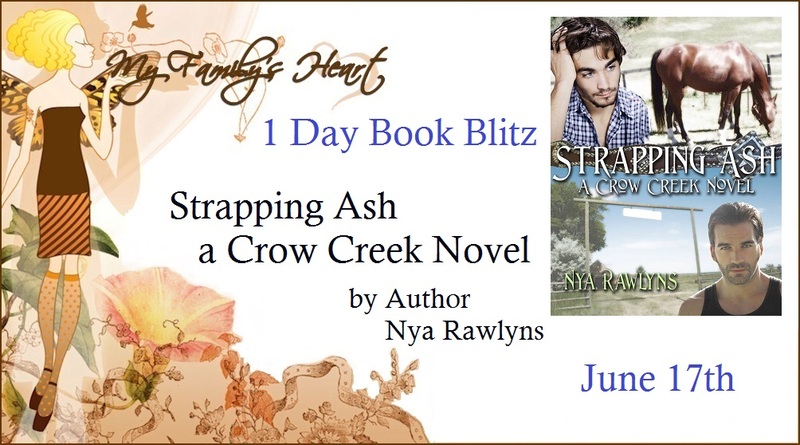 Embarrassed at his own cowardice, he tried to deflect his confusion by explaining, “That’s called strapping.” He waved in the general direction of the piece of leather in the bucket, then quickly crossed his arms over his chest to stop himself from touching Ash. “Yeah. The impact, when you smack it down like that? It feels good.” He felt the heat rush up his neck to the tips of his ears. Jesus, I didn’t just say that. Ash shuffled his feet and ducked his head as he fumbled in a pocket. Oak asked, “What’s this?” as the tall man handed him a postcard and a metal object. Oak watched the man turn right and head down the driveway, his heart pounding treble time. He fingered the key, a slow smile spreading across his face. Nya Rawlyns is a writer, editor and hopeless optimist. She’s lived on a sailboat on the Chesapeake Bay, ridden more than 1000 miles in trail competitions on horseback and been owned by two Newfoundlands. She’s currently staff for a herd of cats and a herd of horses. She writes edgy romance, where emotion is a contact sport, rough and often raw. It need not be pleasant, heart-warming or forever after. What she seeks is what lies beneath--a dance of extremes, the intersect of need and desire, and the compromises you make when pain and pleasure become indistinguishable.